Superior Residences of Brandon Memory Care’s 2017 team. The Greater Riverview Chamber of Commerce (GRCC) is gearing up for their 24th annual golf tournament on Saturday, March 3, at Summerfield Crossings Golf Club. With “fun” being part of GRCC’s Core Values, this golf tournament is an example of how they stick to their values. 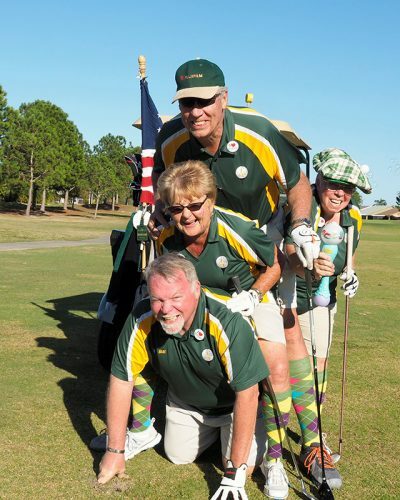 Sign up now to get your team in on the fun (and prizes) by calling GRCC at 813-234-5944, visiting their website at www.riverviewchamber.com or emailing info@riverviewchamber.com. The day will begin at 10:30 a.m. with registration and a business midway to be enjoyed by golfers and non-golfers alike. The Putting Contest will also be open at this time for all to try their luck at winning a great prize. At noon, Bryan Hindman Electric, LLC will launch the infamous Ball Drop. Be sure to purchase your ball chances now, so that you have the chance of going home with hundreds of “greens” in your pocket. The public is encouraged to attend these pre-tournament festivities and your Ball Drop winnings will be even greater if you are present. There will be snacks and beverages served for those enjoying the expo area. New this year, for anyone to take a swing at it, will be a dunk tank provided by Preservation 1st Financial Group. There will be folks in the tank you will want to dunk, i.e. political candidates, chamber members, etc. At 12:30 p.m. Event Chair Mike Jones, World’s Finest Chocolates, will kick off the tournament with a shotgun start. From there, the real fun begins. Whether you are a serious player trying to have the lowest score of the day or you are a novice and just want to have a little fun, this tournament is for you. You may be the winner of Century 21 Beggins Enterprises $10,000 Hole-in-One Contest or you may have the highest bid on a cool item in the Live Auction. Either way you will be having a great time. Many thanks to this year’s top Sponsors: #Asphaltbabe LLC, Preservation 1st Financial Group LLC, South Bay Hospital, The Mosaic Company and World’s Finest Chocolate. Also, thanks to our beverage sponsor, Riverview Mortgage.